To add a new golf course, click the + icon on the Golf Courses tab. The golf course will require that both a name and at least a single tee are added before the golf course may be saved. The postcode/zipcode field is used when setting up the range finding feature of Quickscore+ (see here). 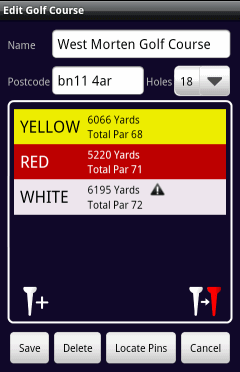 After setting the required number of holes for the course (6, 9, 18 or 24), a tee may be added by clicking the tee icon. Select the colour of the tee and the 'configure tee' screen will then be displayed. [Note: for a particular tee, if the female values for par etc. differ from those used for male players then it may be necessary to select and configure two versions of the tee, one for the colour with no suffix and one for the colour suffixed with (L). For example 'Blue' for men and 'Blue(L)' for ladies]. To add a new tee based on the values entered for an existing tee (e.g. in cases where the par etc. are the same), long-click the tee to be copied and select the colour of the new tee. The new tee may then be edited in the usual way. Only the tees that are actually going to be used need be configured. Additional tees may be added to a course at a later date if required. To configure the various values relevant to a tee, click the numbers and select the required value. For the yardages, enter the required value on the displayed keypad and tap the 'Ent' key. 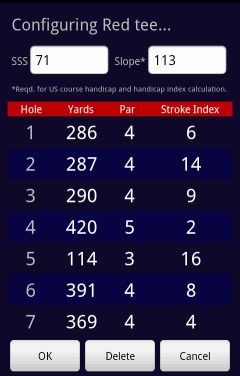 The Stroke Index column (or Handicap column in USGA mode) is the only column that actually needs to be entered correctly in order that the scorecard is able to accurately calculate the scores. This column dictates on which holes a player may receive extra strokes. The column heading will display a warning triangle if the currently entered values are found to be invalid (i.e. more than one hole shares a value). The columns for par and yards should be entered for completeness but are not strictly necessary and are used for display purposes only. The field for Standard Scratch Score (or Course Rating in USGA mode) is required for the calculation of player handicaps/handicap indexes. It is also used when calculating the extra strokes received if players are playing off of tees with varying difficulties. The field for Slope is required for translating a USGA handicap index to a course handicap only. It is not required for tees on UK/IRL golf courses. Calculating a USGA handicap index. Copyright © 2019 Aptomo. All rights reserved.